His Grace Zachariah Mar Nicholovos, Assistant Metropolitan of the Northeast American Diocese celebrates his 51st birthday today. Thirumeni has been instrumental in the progressive growth of the Northeast American Diocese in his role as Assistant Metropolitan. 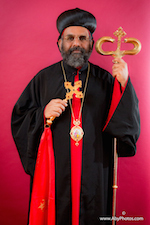 May God grant our beloved Thirumeni many more years of health, grace, and strength as he continues in his episcopal ministry to our Diocese.